New build basement and cellar construction. High land prices make it is sensible & feasible to increase the living space within the house without extending its footprint. There are more and more building plots available where developing the site is made more difficult, for instance by a sloping site. Whilst the land can be cheaper the cost of development may be more than you expect. 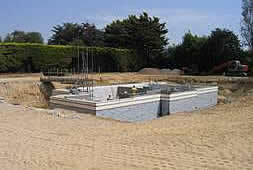 By a building a basement, the extra cost in the foundation work can be offset by creating extra living space. By introducing a basement into the build, this can not only utilize the slope to its maximum, but also stabilize the site and provide the foundations for the house above. Polarwall has supplied numerous developments where the owners have done exactly this. The results can provide a practical and beautiful way to increase the living space and create a lifestyle home.. Although most planning authorities will wish to see a planning application for a basement, because it is generally hidden, the visual impact can be reduced. Planning permission can therefore be easier to obtain if you need the extra living space, but can't build higher because of planning restriction. New basement technologies, such as Polarwall, have quickened the build time and reduced the cost of basement construction. 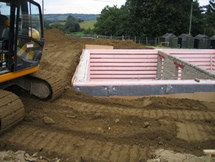 One of the major costs of basement construction is the removal from site of the soil, and though this can sometimes be “lost” on larger sites, for compact sites it can be expensive. However, basements do not have to be fully immersed and basement construction that is partly below ground and partly above ground can save money and let in natural light. Sloping sites make for great basements, as one side can be opened to create a “walk out”, providing lots of natural light. A modern basement should always be dry. There are so many ways to keep the moisture out, (we would always advocate a belt and braces approach). Each basement project needs to be treated in its own right as site conditions will normally dictate the level of protection required. We have undertaken extensive research into various methods of waterproofing, and have access to professionals who can advise on the correct waterproofing methods, please click here to read more. We work with structural waterproofing companies who provide full warrantys on their work. Further cover on a property based insurnace policy can also be arranged. This will guarantee a dry basement from day one. Developers no longer have to worry about the cost of putting a leaky basement right! Polarwall is ideal for any basement and retaining wall construction. The wall core can be 200mm, 250mm or 300mm depending upon the structural loading and the soil pressures. A brick corbel can be formed at the top of the wall to any width which might be required. We are able to offer contact to one of the Polarwall basement specialists in your area to construct your project and to design your waterproofing solution. Use our selector to establish what Polarwall product you would need to use.